As an office manager, you are responsible for everything from authorizing purchases and paying the bills to managing projects, deadlines and priorities, mediating conflicts and being the go-to expert for all questions, problems and office crises. You are the behind-the-scenes person who keeps your entire office running like clockwork. Others may not always be aware of just how much you accomplish, but one thing is certain — without you, your office would descend into chaos! 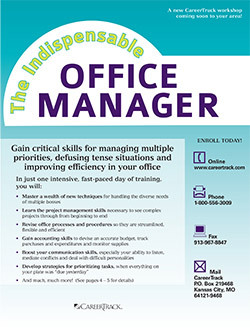 Whether you are a newer office manager searching for ways to take control of your job, an administrative professional with office management responsibilities, a small business owner looking to expand your office management capabilities or a seasoned office manager in the market for some updating and refreshing of skills, this course is a perfect one-day overview of essential tools, strategies and techniques you can put to use as soon as you return to the office. In today's do-more-with-less workplace, it's tougher than ever to stay calm, focused and energized. As an office manager, you're being pulled in a million different directions, have likely been asked to take on added administrative responsibilities and are still expected to function at your highest level of productivity. It's up to you to handle crises, put out fires, keep an entire office humming along smoothly, deal with difficult personalities, manage time, projects and priorities and answer to multiple bosses … and that's just scratching the surface of your responsibilities! Your job may seem overwhelming at times, but it doesn't have to be. Believe it or not, you can improve your performance and productivity without sacrificing any more of your precious time or energy. 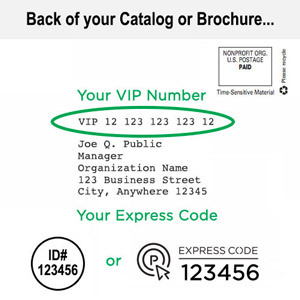 In fact, we'll show you ways to streamline systems and procedures, boost your organizational skills and accomplish more than you ever thought possible. This exciting workshop gives you so many tools, tips, tricks and strategies for excelling as an office manager. You'll wonder how you ever got along without this training! You'll master dozens of new ways to work smarter and more efficiently (not harder). Gain the knowledge you need to take your skills and abilities to the next level of excellence. Your top three responsibilities — master these and the rest of your job will come easily! The myth of "organized chaos"